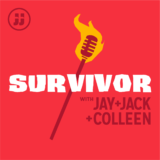 Survivor with Jay and Jack (JJ+): Ep. 5.1 “Second Chance” | Jay and Jack TV - We Make TV Watchable! Jay, Jack, and Colleen discuss the first episode of Survivor: Cambodia.